The Meade 8" LX90-ACF Telescope yields similar optical brilliance to the LX200 flagships, but in a package providing better value for those primarily observing rather than imaging. The quality, workmanship, design, and features will satisfy novices and experienced professionals alike. This is the "ACF" version of the 8" LX90, which stands for "Advanced Coma-Free". 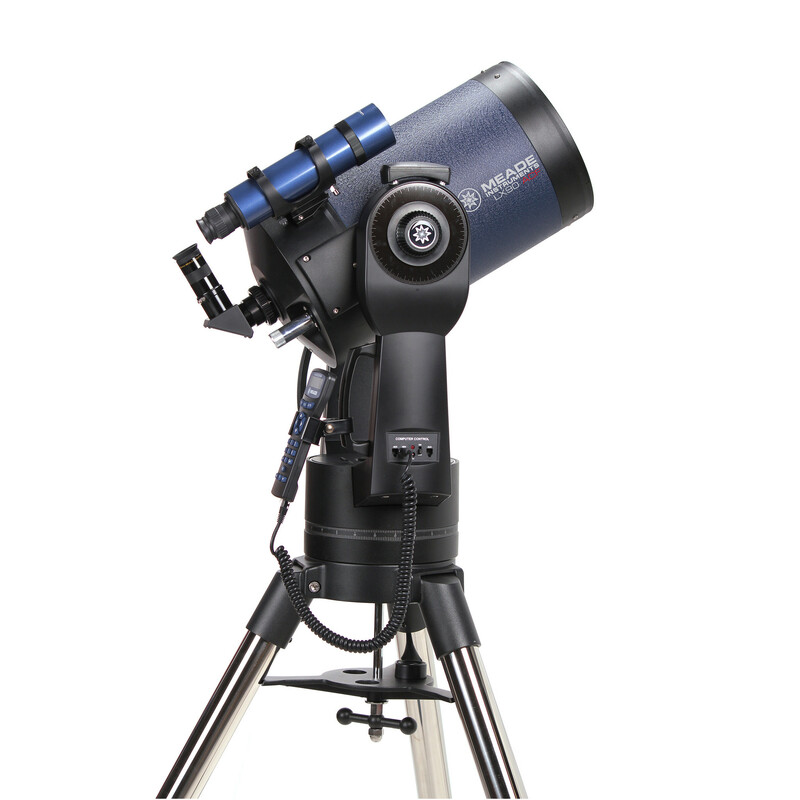 Meade has employed advancements beyond the traditional Schmidt-Cassegrain catadioptrics for the LX90-ACF, gaining significant resolution increases as you move away from the center of the field towards the edge. The 8" LX90-ACF with UHTC multicoatings provides enough aperture for some serious deep space viewing, but is a size that can be managed simply enough by one person, even to a remote location. 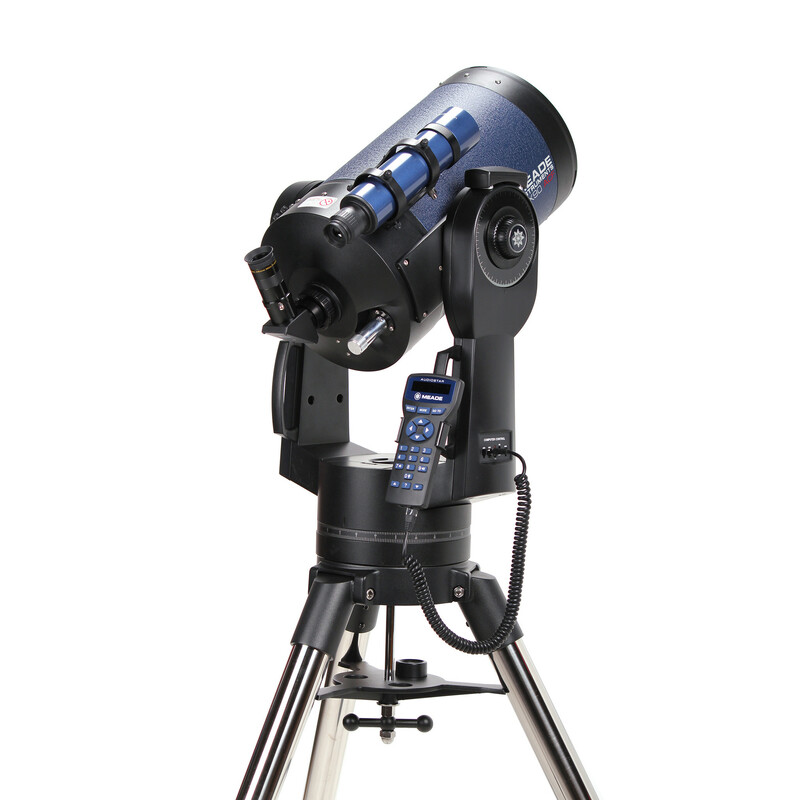 Meade's combined high quality optics, stable double fork mounting, computerized control, and streamlined appearance in a single unit. The list of technology within is long and exhaustive: a rigid mount with beefy tripod, an oversized primary mirror, truly diffraction-limited optics, and the very finest of simple and accurate GPS-enabled alignment. The 8" LX90-ACF's standard-equipment AudioStar computer controller connects to the telescope's control panel and permits viewing and tracking of 30,223 database objects. That's 50 objects in the solar system, 8 major planets from Mercury to Pluto, the Moon, 26 asteroids & 15 comets. An apparent endless supply of galaxies, diffuse nebulae, planetary nebulae and star clusters are present, including the complete Messier, Caldwell, IC, and NGC catalogs. You'll also enjoy looking at 50 satellites, including the International Space Station and the Hubble telescope. You can do some light-duty lunar/planetary imaging (of up to ~5 minute exposures) with the LX90 through the eyepiece using a digiscoping adapter or with an SLR via the SLR adapter and your camera system's specific T-mount. For deep space images of exposures much longer than a few minutes, you'll need either a Meade Deep Sky Imager (which uses software to correct for field rotation) or their dedicated #07002-1 Wedge to turn it into an equatorial-type scope. 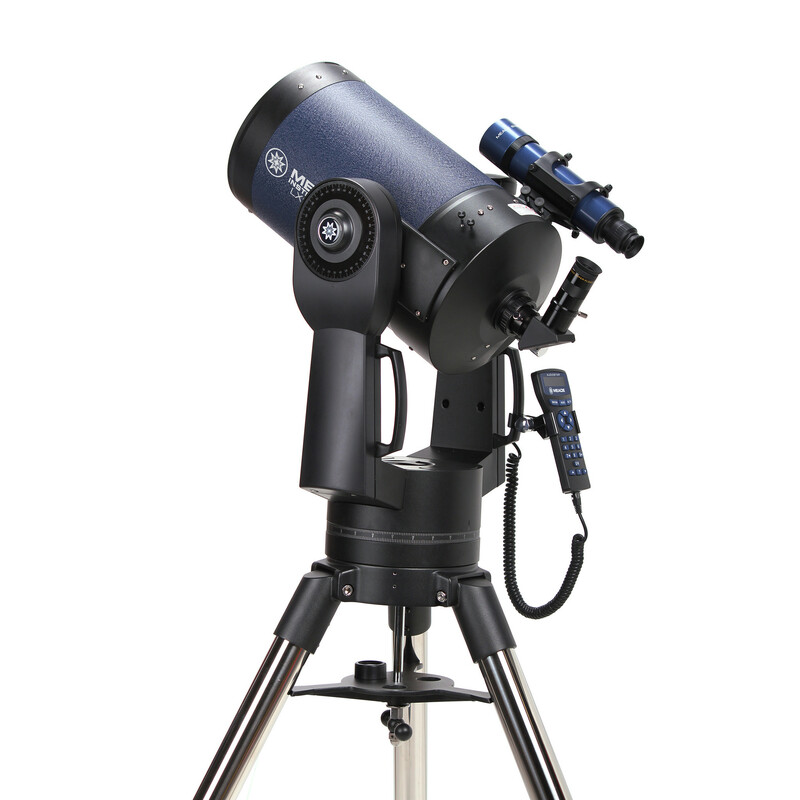 Make ~5-minute lunar/planetary exposures in the LX90's standard mode (with a digiscoping adapter or SLR camera adapter), or longer exposure deep space images by adding either a Meade Deep Sky Imager or Meade's #07002-1 Wedge. Box Dimensions (LxWxH) 39.0 x 35.0 x 14.0"